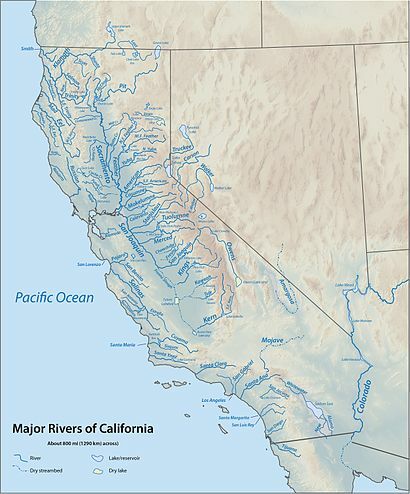 This is a list of rivers in the U.S. state of California, grouped by region. Major lakes and reservoirs, if applicable, are indicated in italics. Rivers and streams between the Oregon border and Humboldt Bay that empty into the Pacific Ocean (arranged north to south; tributaries with those entering nearest the sea first). Bold indicates rivers with more detailed lists in following sections. For additional detail on Humboldt Bay streams, see Humboldt Bay: Bay tributaries and sloughs. For details of the Sonoma and Marin coasts, see List of watercourses in the San Francisco Bay Area. 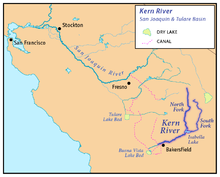 Streams that empty into San Francisco Bay or its tributary bays (arranged clockwise, starting at the north side of the Golden Gate; tributaries are listed from those entering nearest the bays to farthest). 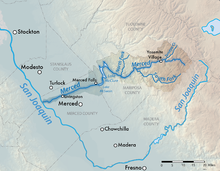 The Central Valley watershed feeding into Suisun Bay via the Sacramento–San Joaquin Delta is excluded; see the following section for the Sacramento and San Joaquin river systems. 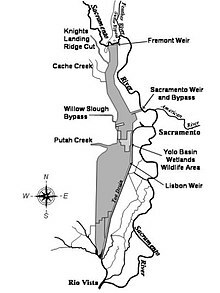 For additional detail on Bay Area creeks, see List of watercourses in the San Francisco Bay Area. 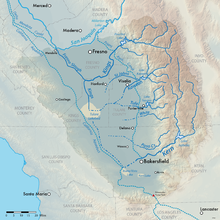 The Sacramento and San Joaquin River systems drain the western slope of the Sierra Nevada and most of the Central Valley, forming the Sacramento–San Joaquin River Delta before emptying into Suisun Bay; together, they are the largest river system in California. 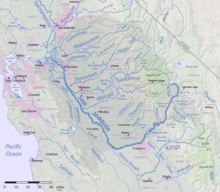 Yolo Bypass ( jump to tributaries) – manmade floodway, occasionally receiving floodwaters from the Sacramento River via Fremont Weir near Knights Landing. 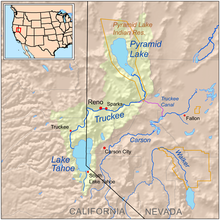 Note: In the Delta the Mokelumne River divides into two short branches, also called the "North Fork" and "South Fork", which recombine before reaching the San Joaquin River. Rivers that empty into the Pacific Ocean between the Golden Gate and Point Arguello, arranged in order from north to south. 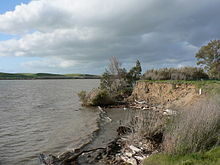 For details of the San Mateo coast, see List of watercourses in the San Francisco Bay Area. 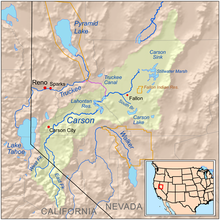 The Carrizo Plain is a large enclosed valley near the Central Coast which drains into Soda Lake. Streams terminating in the Badwater Basin in Death Valley National Park. 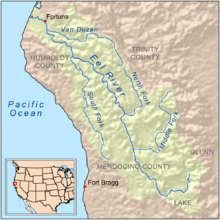 Wikimedia Commons has media related to Rivers of California.